My recent explorations into Gamma World (and post-apocalypticism generally) brought to mind Walter M. Miller's 1960 novel, A Canticle for Leibowitz, which I have considered one of my favorites since I first encountered in high school. The novel is an outgrowth of three science fiction novelettes Miller wrote for publication, only two of which ever appeared independently (both in the pages of The Magazine of Science Fiction and Fantasy). It was while working on the third that Miller decided to rework it and the two previous ones to create a single novel consisting of three parts, each of which told a portion of a larger story. A Canticle for Leibowitz takes place some six centuries after a nuclear holocaust (known as "the Flame Deluge" in the setting) has ended human civilization as we now know it, creating a new dark age. The survivors of this disaster took out their anger not just on the scientists whose weapons had brought it about, but on all learned people, leading to the destruction of much knowledge, including books. What knowledge survives is largely in the hands of the Church, repeating its medieval role as a preserver and copier of ancient texts. All three parts of the novel focus on the Albertian Order of Leibowitz, a group of monks founded by a military engineer who converted to Catholicism and decided to stem the tide of "the Simplification," as the destruction of knowledge was known. The novel's first part (Fiat Homo) centers on Brother Francis Gerard, a young monk who discovers a ruin in which he finds possible relics associated with Leibowitz, whose cause for canonization is currently under consideration in New Rome. The second part (Fiat Lux) takes place hundreds of years later, after Leibowitz has been declared a saint. Civilization has crawled back up to roughly the level of the Renaissance or early modern period, with technology similarly advanced. Rising nation-states covet the Church's store of knowledge and seek to use it to pursue their own agendas. The third part (Fiat Voluntas Tua) is many more centuries in the future, after humanity has developed nuclear weapons and space travel. Two super-powers are on the brink of war and a new Flame Deluge seems likely, with the Church taking steps to ensure that, once again, all knowledge is not lost in the coming conflagration. 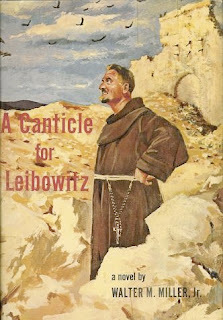 A Canticle for Leibowitz is, as I said, one of my favorite books and made a strong impression on me a a younger man. While far more "realistic" than, say, Gamma World, I've nevertheless imported elements of the novel into most post-apocalyptic RPG campaigns I've run. The world Miller describes, as well as the situations, are very compelling and, above all, very human. His is not a world of black-hatted villains and white-hatted heroes but of people trying to do right according to their own lights, even when "doing right" is often, by some standards, quite evil. It's that complexity that sets A Canticle for Leibowitz head and shoulders above most other post-apocalyptic science fiction of its time (or indeed any other). Miller himself was an interesting character. He served in the US Army Air Corps during World War II, mostly on bombing missions. One such mission involved the destruction of the Benedictine abbey of Monte Cassino, the mother house of Western monasticism, which the Allies mistakenly believed was being used by the Germans as an ammo dump and staging ground. Interestingly, it was German commanders who, upon learning of the possibility of an attack on Monte Cassino, ordered its treasures to be taken away and put into the custody of the Church so that they might be preserved. Miller was so moved by the destruction of Monte Cassino that he eventually converted to Catholicism and spent much of his life haunted by his hand in it. A Canticle for Leibowitz is clearly inspired by his experiences in World War II. Another good read is "The Long Tomorrow." Go Amish and Mennonites! For a more off the wall Gamma World feel I have to mention Hiero's Journey and Unforsaken Hiero by Sterling Lanier. Be sure to check out the sequel, completed by Terry Bisson after Miller's death. It's called St. Leibowitz and the Wild Horse Woman. "The world Miller describes, as well as the situations, are very compelling and, above all, very human. His is not a world of black-hatted villains and white-hatted heroes but of people trying to do right according to their own lights, even when 'doing right' is often, by some standards, quite evil. It's that complexity that sets A Canticle for Leibowitz head and shoulders above most other post-apocalyptic science fiction of its time (or indeed any other)." I may be alone in this, but I absolutely hated the sequel, which seemed devoid of almost any of the things I so liked in the original. I wasn't aware there was a sequel to "A Canticle for Liebowitz" but my mind boggles at the thought --- I thought the final chapter was most compelling simply because we (like the characters in the book)did not know what would happen. A 'sequel' might undermine that. Like you, I read it while in High School and have re-read it a few times since then. What I appreciate most about the book is that the author does not shy away from difficult questions --- the scene with the abbot at the euthanasia camp is quite interesting because I find the position taken by the mother of the child (who wants her child's suffering to stop) as or more compelling as that taken by the abbot (who wants her not to euthanize the child and herself). Somehow, the debate is more interesting if the author does not tell you which way you ought to feel and instead challenges you to make up your own mind. Great book! Read it years ago. I was unaware there was a sequel. Tis a shame. In true Highlander fashion: "There can be only one!" Well, . . . unless we think there is more money to milk from this franchise. The sequel is pretty unreadable and should never have been published when it was so far from a final draft. Nevertheless, the original book plus Earth Abides by George Steward and I am Legend by Matheson are the peaks of the post-apocalypse sub-genre and all three are treasured possessions. I read this book in college, and like the other commentators here (and JM), found it gripping. The ideas were inspiring, and the tragic cyclical nature of human rise and fall both properly intimidating and somewhat romantic. In fact, one of my grad school profs used this in a western civ class for a while. When I returned to it in 2001 (coincidence), I found that it had not aged as well as its memory. Despite the impressive concept, Miller is not a very strong writer, IMO. I enthusiastically recommended to a reading group, and we all found it a bit tough going. I chalk it up to one of those books that was extremely important for me at a certain time but which is not one I'll reread over and over again (like Howard, or O'Brian). oops... that last line should have been "unlike Howard or O'Brian" (i.e., those are two that I have reread multiple times). @ Nagora: "I am Legend" really is one of the stories of speculative fiction, whether one classes it as post-apocalyptic, science-fiction, or horror. The ending is brilliant. H. Beam Piper's "The Return" is another old favorite. Notice that I did not endorse the sequel--I just pointed out that it existed and that people should check it out. For the record, I believe it is an abomination. And I agree with the comments re: "I Am Legend". Definitely speculative fiction first, and then slotted into a marketing category second. Oh man, I found the ending of Canticle.. just tear jerking. I actually liked the sequel, but in all fairness at least a dozen years had passed since reading the first book. On the other hand I would have probably liked it less if it had been too similar to the first (in which case why bother writing it?). I thought Miller was probing some unfamiliar ground with the elements of Eastern mysticism and paganism mixed in with the Catholicism, and also that the sequel was a bit more action oriented, which is not necessarily a flaw. I thought the dark humor, fatalism, and other themes from the first book were not entirely absent, but again my memory of the first is not as clear. Abomination? That's harsh. It is only because the first was so excellent that the sequel suffers in comparison. I think it would be a book most writers could be proud of! As an aside I saw a quote from JRRT about the importance of starting with a map and the sequel bears this out -- Miller had not drawn a map and the reconstructed map that was made for the sequel is not very good. I think Miller's short stories are quite good too. I LOVE that book, though I don't really consider it pulp. It's literature. If you want to see a man really really haunted by Monte Cassino, check out the Miller-edited [i]Beyond Armageddon[/i]. Fantastic book. I discovered it several years ago while working at a used book store. Didn't take long to read it, once I picked up a copy (there were several at the store at the time). Makes me want to dust off my copy, and makes me long for that old job as well. "And I agree with the comments re: "I Am Legend". Definitely speculative fiction first, and then slotted into a marketing category second." If I Am Legend isn't post-apocalypse then I can't imagine anything qualifying as such, including the Book of Revelations! Abomination? That's harsh. It is only because the first was so excellent that the sequel suffers in comparison. I think it would be a book most writers could be proud of! I don't know; I really felt the sequel was off in terms of both its writing and its tone. It didn't feel like the same writer had written both and I don't say that simply because Miller had a ghost writer for the sequel. I was reminded of Asimov's later Robot and Foundation books, where it was clear the author didn't remember what he'd done with the originals or why people had liked them so much. NPR staged a radio theater version of Canticle for Leibowitz back in 1981. Abridged, of course, but OMG, both the humor and the haunting music of an otherwise minimalist production. I strongly recommend it if you can find the CD set. Word verification: Vocraur - a plate ornamental throat guard embroided with paltinum and gemstones, worn by the Sueli nobility at the height of its rule. Read this over the weekend. Fun book. I needed to look up all the latin, though. A Glimmer of Hope for Conan?